Strategic management courses are essential for managers wishing to improve the performance of their team. Strategic management is an essential aspect of business administration that entails designing a long-term approach to the management of resources and processes. 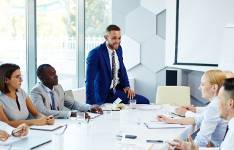 Courses in strategic management are designed to enable managers and executives to maximise the benefits of their management techniques and efforts. Strategic management methodologies look at the long-term and short-term goals of a business, and provide frameworks for devising business strategies that align these goals and boost performance. For any manager or executive, strategic management skills are absolutely essential. With strategic management training, managers can take their skills to the next level and prove their value to an organisation as one who can effectively manage and improve organisational performance. Strategic management is closely connected to the operations of a company. All the steps of business development are accounted for when launching a clear strategy: from the initial phase of designing a business plan, to the market analysis through to the implementation and the ongoing assessment. A successful outcome of strategic management should reflect the initial projections with regards to the administration of resources and performance. Senior managers are the ones in charge of setting in place a business strategy, validating it with the stakeholders and ensuring that the vision, mission and objectives are aligned with their expectations. Securing a competitive position in the industry you represent also involves being flexible and being able to adjust to change. As market premises change, an organisation's strategy may require adjustments, to ensure all processes are kept on track with the higher vision in mind. Managing change is part of the strategic thinking in business administration and often one of the most challenging tests to a company's administration. Such coursers that can help with this area are competitive intelligence courses, which are aimed at highly qualified individuals who wish to master the core business competencies and who intend to use these competencies in strategic projects. A key goal of strategic management is to improve the decision-making process of an organisation, both short- and long-term. With a clear overview of the stakeholders' expectations, a successful assessment of the internal resources and a dedicated management team that's well connected to the realities of the workplace, executive decisions are made to capture the best interest of the organisation and its stakeholders. Why Strategic Management Training Courses? Professional training courses in Strategic Management have been designed by industry experts to explain the most successful approaches when designing a business strategy and tailoring it to specific organisational premises. Although a universal solution to strategic management cannot be prescribed to all organisations, strategic best practice outlines the steps through which an organisation can devise a mature and suitable strategy that keeps it successful. An increasing number of executives from all industry sectors choose strategic management training to get exposed to the latest approaches to strategy development and to share insight with like-minded professionals. Find the best ways to develop your business strategy, by attending the professional training that can open up your business perspectives. Strategic management courses consider all aspects of business and are available in different formats to address the needs of each organisation of individual. Strategic management open courses are designed to emphasis essential concepts, theories and practices of strategic management. Once managers understand the essentials of strategic management, they can tailor and adapt these strategies to their own organisation and circumstances. In-house courses in strategic management are popular choices for organisations seeking to directly improve their management and performance. These in-house strategic management courses are bespoke and designed to cover the exact requirements of each organisation. With a refined and tailored approach, organisations get maximum benefit from their strategic management training, as they learn techniques that are hand-picked for their relevance. Online courses in strategic management are perfect for professionals who are looking to advance their learning in their own time without compromising their work. With numerous different approaches, the participant will be able to find a course that is perfect for them and their time requirements. Within a company, strategic management manifests in specialists that are employed, and managers that are expected to specify the organisation's overall goal, vision and objectives, as well as develop policies and plans, often in terms of projects and programmes, which are then designed to achieve these objectives. Professionals may find economics courses beneficial to improve their understanding of the financial landscape affecting their strategy. Following initial strategic management responsibilities, those responsible must allocate resources to implement the policies and plans, projects and programs including high-end project management. A high level of expertise is often required to evaluate the overall performance of the business and its progress towards objectives. Strategic management is an ongoing process that evaluates and controls the business and the industries in which the company is involved. Furthermore it allows companies to assesses their competitors and establish strategies to meet all existing and potential competitors; and then reassesses each strategy annually or quarterly to determine how it has been implemented and whether it has succeeded or needs replacement by a new strategy to meet changed circumstances, new technology, new competitors, a new economic environment., or a new social, financial, or political environment.